Simple Urine test, height – weight check, eyesight check, simple ear check by looking, simple throat check by looking. Adult – If you answered YES to any TB ques. For Medical test, girl/lady should not be on her menstrual period. A clear urine result is required to pass the medical exam. You can Generate HAP ID and get medical done even before getting invitation or submitting your final visa application. Average $350 for Adult Australian Immigration Physical. $60 for Child. A kid may need a TB test too. Doctor’s clinic will decide. 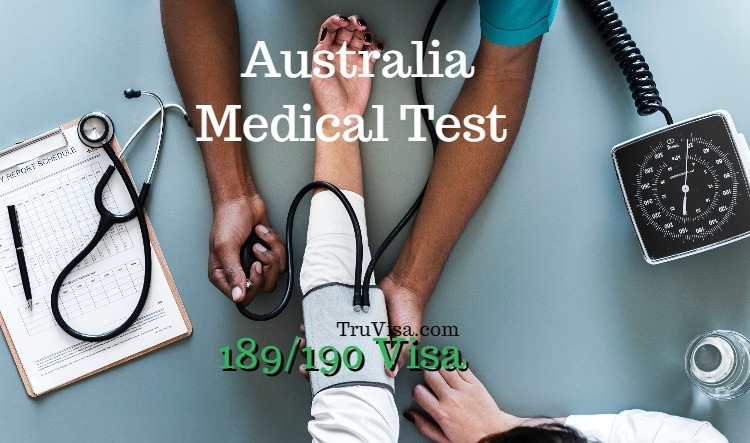 Is Australia Visa 189 / 190 Visa Medical Test in USA Covered by Insurance? Your Health Insurance does not cover immigration purposes due to it not being a medical necessity so it can only be paid in Cash, debit or Credit. 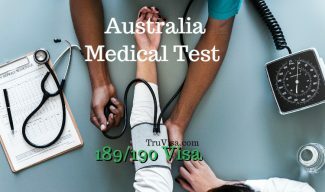 Can Australia Visa Medical Test in USA be paid by HSA? An HSA Card cannot be used as a form of payment due to it being through insurance as well. How much time does Medical test take? The Medical test process takes about an hour but please keep in mind that the hour does not include the time you come-in and fill out your paperwork and wait to be called. In USA, most of the time, the wait is average of an hour for a doctor visit depending on the clinic schedule. INR 6,000 for Adult. INR 4,000 for child. Hello Anil, I got the invitation of 189 visa but my 17 months old daughter have been diagnosed with a disease called “Isovaleric Acidemia” which has caused developmental delay and slow brain activity. It is not a contagious disease. As per doctor’s comment, her brain activity is of a 7-9 months old child. Can this cause an impact on my visa? My wife has just cleared her medical , how long does visa take to be granted after this? I applied for SC189 a week ago and uploaded all the documents except Medicals. Because, I undergone Medicals in Jul 2018 for 457 dependent visa and informed the doctor about my plan for PR visa too. So, he advised me to go for HIV test as well so that I can use the same medicals for my PR application. Now, when I lodged my application I have mentioned the HAP ID which I used for my medicals in Jul 2018. Is it ok to use my 457 dependent visa medicals for my 189 visa.. Kindly share your thoughts.. It should be okay. If anything extra is required, the Case officer will contact and ask your for it. My daughter is 9 years old and a spinal Muscular Atrophy Type 2. she cannot walk and stand but is fine intellectually, will there be a challenge in getting the Australian PR for her? I do not think the nature of your daughter’s problem will affect the Australia PR. I am in California and I see only one Medical center which is nearby in DIBP list – Berkeley. Should I get the medical tests only in this medical center or there is no restriction? You have to do medical in the authorized center only as they have access to upload your reports directly on Australia Immiaccount. You cannot upload the reports yourself. It has to be done by approved medical center. Thank you Anil. Will my kids also get HAP ID? or will they be linked to main applicant? Request your inputs. Kids will get their own HAP ID separately. You should declare that you had TB at the time of generating HAP ID. I don’t think it will be an issue if you do not have TB now. Doctor will run a test again. Doctors take a test that can find out if you ever had TB if you dot declare. If they find it themselves, then it will affect your application adversely as it will considered as a lie. Can you please clarify my doubt. Do we know what kind of medical tests will be conducted for 3 year old kid. My son has speech delay and is able to understand everything. I am currently in US and i suspect my son may not answer any questions from doctor if asked to do. If this will be a problem for visa approval, then i prefer to wait for 6-12 more months and try after my son speaks normal rather than spending $5K for visa fees and medicals. Do the doctors specifically test for developmental delays during the tests?. If you have any insights please let me know. Doctor does communicate with kid for tests. I do not think that speech delay can be a reason to deny visa or PR. The main thing that visa officer looks for is the presence of communicable diseases like HIV or TB or something similar. Doctor does test kid’s throat, eye and ear to find any infections though. It is your choice if you want to apply right away or want to wait. Thank you very much!. I did completed my medical test for the family (myself, son and wife). The doctor did not see any abnormalities with my son, he dint test his speech ability and infact did not spend much time with my son. I received the test results today and it says his medical is passed and no more action is required. Can i safely say that i can proceed with the application or will my son be referred to see pediatrics separately?. Please let me know. You can safely lodge your application. No further tests are required now. I have one question. I have received the invitation of SC 189 . I have submitted the visa application last week and paid the fees. (Self, Spouse, child). I have generated the HAP IDs before submitting the visa application. Should I go for medical tests before case officer is assigned to my visa application? Or I can wait also? As you know, medical test will be valid for only 1 year and I need to stretch that time so that I do not need to go for medical again. Can I wait for another 2 3 months so that I can buy maximum time for visiting Australia? Or since I have generated the HAP ID separately then I have to undergo medical asap? Official guidance says that you should get your medical done as early as possible. If you wait for case officer to tell you to get medical done, you will easily add another 60 days of processing time to your application visa grant. If you get medical done before visa officer starts working on your case, it is possible that there is no need for case officer to contact you and all your papers are complete. In that case, case officer will simply grant you visa. It is your choice. I recommend getting it done now. Thanks a lot Anil for your help and information. I am highly obliged. I am currently living in the US and waiting for my visa extension. I am getting relocated to different city in next few days so need to wait for the medical appointment in new city. If we get the medical done and are not able to travel AUS within one year then re medical test will help or we cannt use the PR anymore? You will get an initial entry date once you get your Australia PR. You will have to travel to Australia at-least once before this date to activate your PR. Medical is needed only once for getting the PR. Hi Anil Gupta, Am i Planning for Australia PR and looking for Good Consultant for the same. Will you provide Consultancy, if yes then how to reach you.Please let me know. You can ask me any questions you have for Australia PR here free of cost. Thanks, Please help with the Scope of System Administrator 262113 in Visa 189,190 & 489 Australia. You need at least 75 points to have any realistic chance of getting an invite. As per 11 Nov draw, people with 80 points got the invitation. I generated the HAP ID before filing the visa application. Hence in my IMMI account there are two separate applications. Do I need to link these applications? Because how the case officer will come to know that my medicals are also completed? Is there an option to connect the two medicals? I am not sure how this can be done if possible. Sorry for the confusion. There are not two medicals. Medical test was submitted once only. Just asking how to connect the medical with SC189 application? When you had rwcerece invitation, did you sign in to the existing immiaccount (that you created earlier for medical) or created a new immiaccount login after clicking ‘accept’ invitation? If your signed in using the existing immiaccount, your medicals will be automatically connected to your EOI and visa application. I have only one IMMI account and both SC189 and medical applications are present in the same account. I never created any separate account for medicals before getting the invite. I received the invite on 12 Oct 2018 and created the account on 13th Oct 2018 and started with the SC189 application. Parallely I initiated new application manually for medicals in the same account to get the HAP IDs. I didn’t want to wait for the CO to come and provide the HAP IDs. Medical: Submitted by doctor on 14th Dec 2018. Will the case officer be aware that medicals are already submitted for myself and family? In that case, you don’t need to do anything. Your medicals are automatically connected to your application. This is a big relief to me. Thanks a ton for your guidance…. Hi Anil, Hope you are fine. I have received Request for more Information from AUS Authorities. We did not change the last name of my wife to match my last name on her passport. Her 10th 12th Graduation marksheets are also with old name. However, in the marriage certificate her last name was changed. My daughter’s passport also has her changed last name. Request for more evidence for my wife states” Please provide an explanation and evidence of difference in surnames”. What should I do in this case? Your question about surname change proof is out of scope of this article. I have added it to our forum and answered it there. You can ask follow up question of forum itself. We answer within 1-24 hours. Can you please let me know where can I get HAP ID? Do we get appointment quickly in US? I assume this is not as time consuming as Indian PCC which an take upto 4-6 weeks. Also, can we do before we get ITA (I’m expecting ITA in Nov round) to save time? Medical reports are uploaded directly to immiaccount website by doctors and they take 7-14 days. The doctors appointment might take time in USA. Yes, you can do it before getting ITA but I recommend doing it after ITA. Thanks Anil. In Step 8 (Health declarations), Does any applicant intend to work as, or study to be a doctor, dentist, nurse or paramedic during their stay in Australia? Does this mean does the primary application or dependents intend to “work as a doctor, dentist, nurse or paramedic” or “study to be doctor, dentist, nurse or paramedic”? My EOI is for 261313 and I’m not claiming any points for my wife and she is not in the field of medicine as well. Then, you should answer ‘No’.